Like New. LIKE NEW-This book is in like NEW condition and in its like NEW dust jacket. It is without a remainder mark. Signed by the Author and has a mark in the front cover. Campoy, F. Isabel. 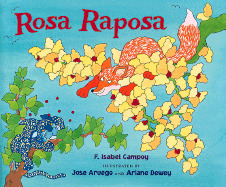 ROSA RAPOSA. San Diego: Harcourt, Inc., c2002. First edition, First printing. Unpaginated, Illustrated by Jose Aruego and Ariane Dewey, Oblong 4to, As new hardbound in d/w, .